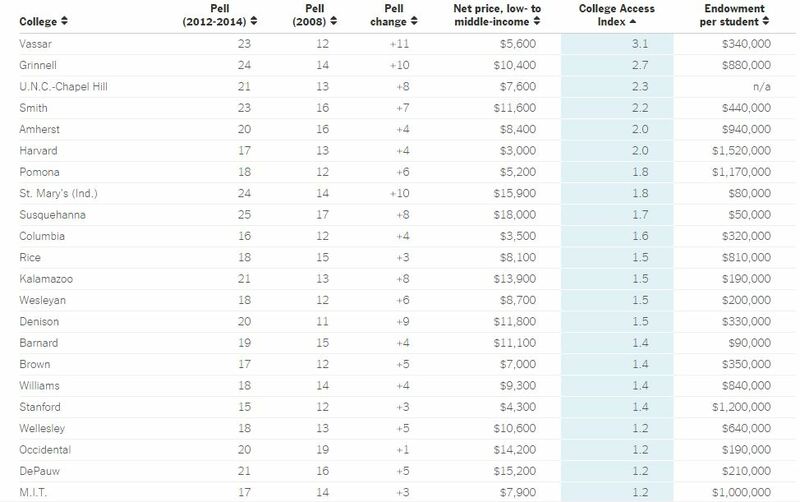 Currently browsing posts filed under "Socio-ec Admissions"
Whitney Wilson ’90 points out this Washington Post article (and chart) about the rise in the percentage of Pell Grant recipients at elite schools like Williams. For background information on this topic, read this, this and our ten (!) part series from 2014. Let’s spend a week on this topic. Today is Day 3. Here is the happy story of Vassar. 1) There has been no meaningful change in the percentage of students who come from families in the top 1%. It was 10% 15 years ago. It around 10% now. I, obviously, have no problem with that, but the Washington Post ought to at least mention this narrative-challenging fact. Is Rob Anderson a reporter or Cappy Hill’s PR flack? 2) At the other end of the distribution, only 5.4% of Vassar students are currently from families in the bottom quintile of the income distribution. Alas, the Times does not show us the time series of that statistic, but I bet that it has been fairly steady over time. Vassar has offered plenty of students full scholarships for decades. 3) In Cappy’s defense, there has been some movement lower in between the 20th and the 90th percentile of the income distribution. In essence, she replaced a bunch of students with incomes around the 65th percentile (around $70,000) with students from families making more like $50,000. The former group are not eligible for Pell, the latter are. Is this some giant victory for the forces of social justice? I doubt it. Private colleges face their own constraints. They rely more heavily on tuition revenue, making it essential to enroll a large number of students who pay in full. They also set aside seats for children of alumni, known as “legacies.” Like public colleges, they also hold spots for athletes and chase students with high SAT or ACT scores, despite evidence that performance on admission tests is linked to family income. How many stupidities can Rob Anderson put into one paragraph? First, the average academic credentials of legacies at Williams are better than those of non-legacies. The same is almost certainly true at Vassar and at Princeton. Second, “performance on admission tests is linked to family income” because rich parents are, on average, smarter than poor parents, and all parents pass on their genes to their children. Whitney Wilson ’90 points out this Washington Post article (and chart) about the rise in the percentage of Pell Grant recipients at elite schools like Williams. For background information on this topic, read this, this and our ten (!) part series from 2014. Let’s spend a week on this topic. Today is Day 1. The term “preppy” comes, obviously, from the “prep” schools that have been feeding students to Princeton (and Williams) for generations. With that title, you would expect some evidence, or even a discussion, about whether (or not!) there are, in truth, fewer prep schools students at elite colleges. Surprise! There is no discussion. As best we know, there are as many students from prep schools like Andover, Exeter and Groton today as there were 50 years ago. Consider Amherst: 34% (pdf) are from “private” schools in the class of 2020, compared to 38% (pdf) in the class of 2003. Now, you might argue that a 4% decrease is a meaningful change. Maybe. But, a decade ago, it was 35% (pdf) for the class of 2010, so whatever “progress” has been made stopped cold more than a decade ago. I bet that the (lack of) trends at Princeton (and Williams) have been similar. There is no evidence of elite colleges have become less “preppy” over the last decade. There is, however, an increased reliance on Pell Grants to measure economic diversity. Pell Grants, worth up to $5,920 apiece this year, are the foundation of need-based financial aid. They are awarded through a formula that assesses family size, assets, income and other factors. Most go to students whose families make less than $50,000 a year, a range that spans deep poverty to moderate income. We have discussed before that Pell Grants are an imperfect proxy. Recall that international students are not eligible. A school with 50% of its students from very poor Mexican or Brazilian or Ukranian families would not do well because those student aren’t counted in this methodology. More details to come tomorrow. There can be little doubt, however, that going forward, Pell Grants will be important. They even began checking family finances before deciding whom to admit. The point was not to exclude those in need but, possibly, to boost their chances. It used to be that Princeton accepted student X (with family income of $60,000) over student Y (with family income of $50,000, and therefore Pell-eligible) if X had better test scores, grades, recommendation letters and so on. With this new policy, that changes. If Princeton thinks that you will be awarded a Pell, you now have a (large?) advantage over applicants with, for all practical purposes, the same socio-economic standing. What should smart applicants do? Indeed. Advice to applicants: Do whatever you can to convince Furda (and Princeton and Williams and . . .) that you will be eligible for a Pell Grant. Ronit’s comments on this admissions thread merit further discussion. Read the original post for context. [Amherst President Tony] Marx could easily achieve his goal of greater equality by admitting fewer athletic tips from privileged prep schools, and fewer legacies, and giving a few of these slots to exceptional kids from the inner city. First, many/most tips are not from “privileged prep schools.” In fact, football players tend to come from families with below average income (for Williams/Amherst as a whole). Second, it is true that if Amherst got rid of its 66 tips, it could replace them with 66 “poor” students with better academic rankings than the tips they replaced. Amherst teams would then lose most (60%? 80%?) of their games. Now, I suspect that Ronit and I are in agreement that, from the current status quo, Williams/Amherst should place less emphasis on athletics, but that is not the debate we are having today. Marx has never proposed cutting the number of tips. Third, as I have demonstrated ad nauseum, legacies are a red herring in this debate. Even if you put zero weight on legacy status, the vast majority of legacy students who are at Williams today would still have been admitted. Fourth, if this debate were really about “exceptional kids from the inner city,” then you might have a point. But most of the “poor” students that Marx is admitting do not come from the “inner city” and almost none of them attend lousy inner city high schools. And just how “exceptional” are they? But financial aid alone isn’t enough to boost low-income enrollments, many colleges have found. 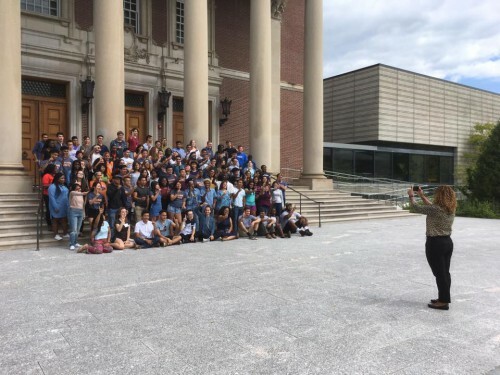 Amherst has hired more admissions staff to do outreach, and it pays for several hundred low-income students a year to visit campus. It also works with nonprofit groups such as QuestBridge, which identifies talented applicants from low-income backgrounds. Current Amherst students from low-income backgrounds can earn their work-study money by mentoring high school counterparts through the college-application and financial-aid process, whether or not they want to apply to Amherst. Ashley Armato worked as a mentor as a student at Amherst, where she recently graduated and started a one-year job in the admissions office. I would not use Armato as an example if she were a pre-frosh, but since she is a college graduate (albeit Amherst) , I hope that few will be offended by using her to make the issue more concrete. (And I have no idea what her academic credentials were.) Ronit thinks that this is an argument about “exceptional kids from the inner city.” If that were true, if Amherst were accepting low-income students with 1350 SATs from (lousy) inner city high schools in place of students with 1500 SATs from Choate, that would be one thing. For Ronit’s case to be plausible, someone like Armato should come from a family with low income (bottom 10%? certainly bottom 25%) and go to a bad high school. But, even before I looked, I doubted that this described Armato. And, sure enough, it doesn’t. As the daughter of a firefighter and a maid, neither of whom went to college, she understood the challenges facing those she mentored. Students often started off assuming they could afford only community colleges, but she was able to explain financial aid and help them expand their options. She also reassured a lot of parents, sometimes speaking with them in Spanish. Does the daughter of a firefighter and a maid count as poor? Does someone who attended Mount Sinai High School suffer from a below-average high school education? No! After five years, NYC firefighters make $86,518. Mount Sinai is a fine public high school, with a full complement of AP courses. Again, for all I know Armato was an AR 1. If so, she would have gotten in (probably) even if her father were an investment banker and she went to Exeter. Yet the whole point of Marx’s proposal is to give an extra advantage to applicants like Armato. The key is that Ronit describes this as letting in “exceptional kids from the inner city.” That’s not what the program actually does. Don’t believe me? Believe Amherst. Bringing in more low-income kids would require added compromise. 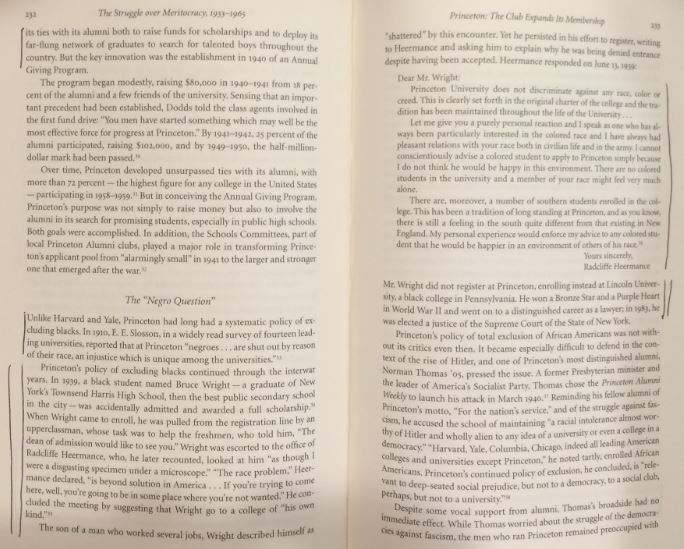 To meet Marx’s 25% goal, Amherst would have to take more threes [on a 1-7 scale], says Parker, meaning those who may have straight As but SATs as low as 1360. Even though Amherst already does so for minorities, legacies, and athletes, faculty members are worried. “This could be a radical departure that fundamentally changes the character of our institution,” warns physics professor David Hall, who heads the Faculty Committee on Admissions & Financial Aid. Again, if we are talking about a kid in a lousy high school and from a family making in the bottom 25% of the income distribution, then there is certainly an argument for admitting her and rejecting the investment banker’s daughter from Milton with 1500 (and better grades). Yet Amherst (and Williams) already does that. But that advantage does not produce enough, in Marx’s opinion, poor families. So, he wants to give similar advantages to students from families with above average incomes who attend top quartile high schools. Had enough? I haven’t even gotten started! I am drawn to the article on Amherst President Marx like a rugger to beer. The centerpiece of Marx’s crusade is to change what happens in the converted 19th century farmhouse where Amherst’s 14 admissions officers work. Marx is convinced that the process is stacked against poor kids. But changing that threatens the entire admissions rationale of elite colleges. The key issue: how much to lower academic credentials. Amherst got to No. 2 in the rankings in part because of its incoming students’ stellar grades and test scores. Those factors are just one part of college rankings, so Amherst might slip only a few spots if other selective colleges don’t follow its lead. Still, that could hurt. “If Marx lets in more low-income kids, he’s going to risk his school’s reputation,” cautions Anthony Carnevale, a senior fellow at the National Center on Education & the Economy. Letting in smart low-income kids does nothing to Amherst’s reputation (except to improve it). Letting in not-so-smart low-income kids has the potential to be devastating to that reputation. Hall is right to be worried. If you think that, on average students with 1360 SATs do as well as though with 1560s, then you don’t know what you are talking about. People like Marx like to tell stories about specific students who come to Amherst with low scores and then thrive, winning academic awards, writing excellent theses, being named to Phi Beta Kappa. And such stories are certainly true. But they do not represent the average result. In fact, the typical academic performance of 3s is certainly worse than that for 1s, even during senior year (by which time any disadvantage in terms of preparation should have been alleviated). The only way to meaningfully increase the percentage of students from the bottom quarter of the income distribution is to admit a bunch of applicants that you currently reject, applicants that are not as academically talented/focused as your other students. Marx hopes to ease such concerns by finding more top-notch low-income applicants. Certainly, many students have never even heard of Amherst. So Marx is asking his admissions officers to visit more low-income high schools. And he’s enlisting Amherst students in a tele-mentoring program in which they walk seniors from those schools through the college application process. 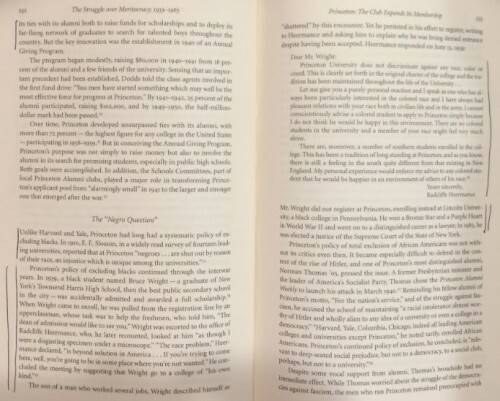 Marx also started using QuestBridge, a Palo Alto (Calif.) nonprofit that has enlisted 8,000 high school teachers to identify talented low-income students for elite colleges. More delusions! But, of course, it depends on what you mean by “top-notch.” There are thousands of low income students with, say, 1250 SATs and high school grades to match who would love to come to Amherst, especially for free. Let them all in and Amherst will be a different place. Although the competition for talented low income students is not as tough as that for URMs or helmet sport athletes, it is getting there. Does Marx really think that more visits to bad high schools are going to help? 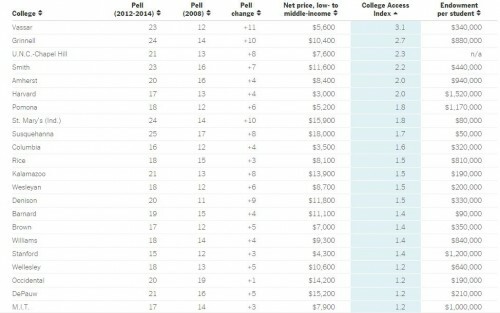 Amherst (and Williams) might be able to accomplish something on the margin, convincing a smart low income kid that she is better off at an LAC than at an Ivy. But the tyranny of numbers remains. There are just not enough low income applicants to go around, just as there are not enough URMs and hockey players. Amherst might be able to steal a couple from its competitors, but not enough to meaningfully change the overall distribution. Unless, that is, Marx succeeds in changing the admissions criteria in use. If I were a Amherst faculty member, I would be worried. EphBlog is powered by WordPress and delivered to you in 7.536 seconds using 50 queries..